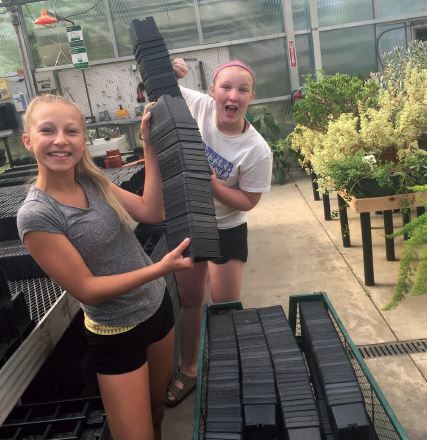 Kensey Reeves and Lacey Argus helped the Friendship Park Conservatory greenhouse staff wash thousands of flower pots during the past summer break. 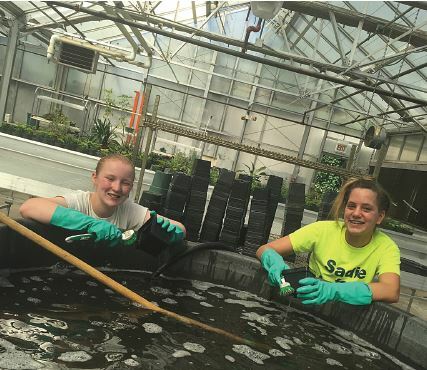 Three Des Plaines Community Foundation student volunteers helped the Friendship Park Conservatory greenhouse staff wash thousands of flower pots during the past summer break. The girls are Chippewa Junior High School students looking to give back to the community. Lacey Argus, Kensey Reeves and Hailey Suwalski were happy to help out the Friendship Park staff and wash a portion of the 25,000 flower pots that are washed every year. According to Barbara Koch, manager of Friendship Park Conservatory at 395 W. Algonquin Rd., the girls put in long hours washing pots to prepare for the next season’s planting in the greenhouse. “By washing the flower pots, instead of replacing them, we keep the costs down and are more earth friendly,” she said. Friendship Park Conservatory greenhouse is a 10,000-square-foot building, which is where all the plants are grown for Mt. Prospect Park District facilities and many parks throughout the district. “We are always looking for student volunteers to help the Foundation to better the future of Des Plaines,” said Argus. A number of student volunteers from Maine West High School have signed up to volunteer their time for elderly Des Plaines residents. • Assisting homeowners in packing and cleaning. • Cutting elderly residents grass and raking leaves. • Snow shoveling for the Des Plaines seniors and disabled. • Soliciting and picking up donations and contributions. • Recruitment of youth volunteers. For example, the Des Plaines Community Foundation has had a presence at the annual Spring Fun Fair at The Mountain View Adventure Center in Prairie Lakes. “Four student softball players got together off the field to lend a helping hand preparing for the event last spring,” said Argus. Student volunteers Maren Garnett, Lacey Argus, Mia Thomas and Makenna Delafeld helped unpack and prepare the bicycle helmets which were distributed to the children. The flower pot girls Hailey Suwalski and Kensey Reeves are Chippewa Junior High School students looking to give back to the community.